CLOSE, BUT NOT enough. The story of a feisty night in the south of France as Munster added just a losing bonus point to their Heineken Champions Cup pool 2 haul. In a tight and frenetic affair, a wholly more enjoyable spectacle than last week’s encounter, Johann van Graan’s side matched the French champions in many facets but were left to rue four missed penalties and a lack of try-scoring opportunities. As is the wont of the tournament’s back-to-back phase, there was tide-turning aplenty early on. Munster were on the wrong end of the penalty count, the possession and territory until very late in the half and even the dominance of the scrum looked under threat in the opening exchanges. Relatively consistent was the stop-start nature of the contest, yet it was stacked with intrigue and physicality with errors punished instead of compounded. Castres had come to play as well as create a fray. Munster were forced to dig deep, and they duly had the shovel out to repel the opening onslaught after Carbery had opened the scoring from long range. There would be little respite from the physical challenge brought by the French champions on home turf. A slight reprieve came through Benjamin Urdapilleta’s shanked penalty after a dominant home scrum, but it was immediately followed by a charging penalty on Niall Scannell. Scott Spedding lay on the turf, but his kick landed on the 22 and Urdapilleta easily leveled the contest. CJ Stander was first to ensure Munster were not to be overpowered, blasting through a midfield gap to cut across halfway on the angle. He was hit with a solid covering tackle and Carbery followed up only to be rocked by Thomas Combezou. The pain of the hit may have been a factor in his missed penalty a minute later, but by the end of the intense opening quarter, the Athy man had raised the flags again to nudge his side back into the lead. It would last only five minutes as CO responded with a lengthy onslaught of pick-and-drives to test Munster’s pillars over and over again. Eventually, Paea Fa’anunu wriggled over despite the best efforts of Tadhg Beirne who gave the TMO a decision to make. Peter O’Mahony complained to referee Wayne Barnes that Chris Cloete was gouged in the set of phases and the South African was targeted for more punishment off the ball before the half was out. The weight of Castres tackling made attacking creativity difficult for Munster and too often Carbery or Rory Scannell appeared uncertain of where the pass should go until they received the ball under pressure. But the visitors did come close to turning the tables before the break, the second meaningful entry to the home 22 ended with a scrum which John Ryan and Dave Kilcoyne turned into a penalty advantage (a fourth win at the set-piece in the first half). Conor Murray sought to make use of the advantage and broke the line in combination with Rory Scannell. Castres survived thanks to a touch of cynicism with Rory Kockott sin-binned before Matthieu Babillot forced a huge penalty to bring the half-time whistle with a 10-6 home lead intact. There was little give or take after the restart either. Carbery reduced the deficit to the minimum, but as the hosts introduced fresh props the maul yielded a penalty and a yellow card for Niall Scannell. Munster battled well with 14, with Tadhg Beirne excellent in the arm wrestle, and Carbery landed a fourth successful penalty. But the burden of the out-half is that misses will often stick in the mind longer than the many accurate strikes. A 69th-minute spark of chip and chase brilliance from Andrew Conway, so prolific in recent weeks, almost yielded a try, but Urdapilleta’s sliding tackle with his feet gained the result he wanted. Conway’s grounding was chalked off for a knock-on. A penalty came for a late tackle on O’Mahony, but Carbery was unable to find the target from the right touchline. Even with their hosts down to 14 a second time, Van Graan’s men were unable to force a way through and Castres Olympique delighted those banging the drum inside Stade Pierre Fabre to muscle out a win that keeps Heineken Champions Cup pool 2 wide open after four rounds. A kick here, a turnover there, could have left Munster in complete control. They still lead the way, but they will go to Kingsholm in round five with only four points between them and Gloucester in fourth. Paea Fa’anunu (Antoine Tichit ’55); Kevin Firmin, Marc Clerc (Wilfrid Hounkpatin ’41), Thibault Lassalle (Christophe Samson ’59), Loic Jacquet, Yannick Caballero, Mathieu Babillot (capt), Maama Vaipulu. Dave Kilcoyne (Jeremy Loughman ’74), Niall Scannell, John Ryan, Tadhg Beirne, Billy Holland (Fineeen Wycherly ’75), Peter O’Mahony (capt), Chris Cloete (Arno Botha ’65), CJ Stander. Email “Munster left to rue missed chances as Castres shade feisty affair”. 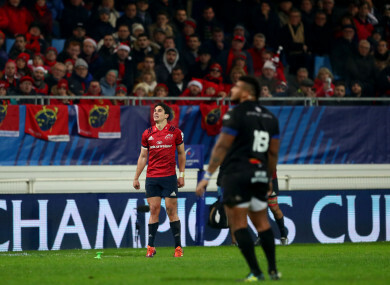 Feedback on “Munster left to rue missed chances as Castres shade feisty affair”.